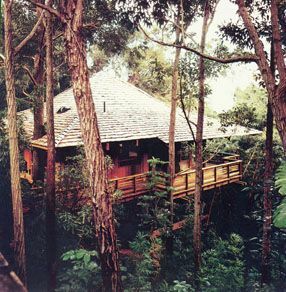 Haiku Houses has been in business for more than 40 years and has custom designed houses for clients throughout United States, including Hawaii. Haiku Houses have provided homes for clients in Great Britain, France, the Netherlands, and the Caribbean. Haiku Houses are adaptable to any building site regardless of the slope of the site and are suitable for all climates. Reminiscent of 16th century Japanese Country Houses, award-winning Haiku Houses use pole-and-beam architecture and are custom crafted from the finest woods. The Haiku Houses depicted in our catalog are the "original" modern design of these Japanese Country Houses, and they are by far the highest quality custom-crafted wood houses available anywhere in the world. Haiku is a form of Japanese poetry. The word haiku means each poem contains seventeen syllables frequently in the order of five syllables then seven then five again. A predominant theme of haiku poetry is the natural world and the relationship and interaction between nature and humankind. Haiku poets emphasize that form and function are one. This philosophy was adopted by Frank Lloyd Wright as his credo; it was the impulse behind his philosophy of design and architecture. The architecture of the Greene brothers at the turn of the century was heavily influenced by such architecture from Japan. In fact, Haiku Houses have many of the features of the Ultimate Bungalows designed by Greene and Greene. The owners of a Haiku House understand that they have bought the simple elegance and beauty that is unavailable in any other architecture. They appreciate that while in some instances they may have originally invested more for their Haiku House than they may have for an ordinary "sticks and bricks" house, the Haiku House is priceless in its inherent peace, tranquility and harmony. Also in many cases this is the most cost effective method of building on complex property. © 1994 - 2018 Haiku Houses All rights reserved.